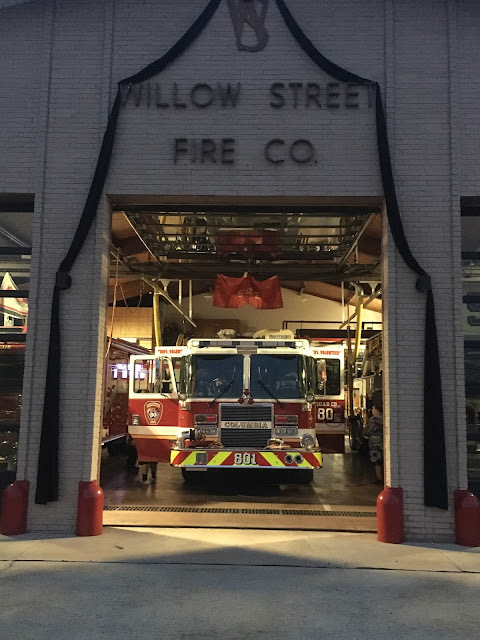 Members of the Columbia Borough Fire Department covered at the Willow Street Fire Company after Willow Street's recent loss of Fire Chief Mike Reese. Five members of the Columbia Borough Fire Department stood by with one of its engines at the Willow Street Fire Company this morning due to Willow Street's recent loss of Fire Chief Mike Reese. Reese, 53, passed away suddenly at home on August 23 after responding to an auto accident that morning. CBFD covered from 12 to 6 a.m. with no calls and was relieved by the Blue Rock Fire Department. Numerous departments are stepping up and taking turns every six hours. Teamwork. Sorry for their unexpected loss.